On January 1st, I officially became self-employed full time. If you’re considering to the same, know that that the transition will be a challenge, and even with strategic planning, there will be curveballs and unforeseen circumstances that you’ll have to deal with. However, with some common sense, diligence, and foresight, you should be able to make the switch without too much financial distress. Unless you are one of the few who already has a venture generating enough profits to easily pay your bills, you’re going to have to tighten your belt financially. Among other things, this will involve saving on groceries, home energy, cell phone, Internet, and cable or satellite TV. A quick review of the competition should provide you some opportunities to save. Next, you’ll want to convert anything you can into cash. Start by selling unused small electronics or other unneeded items on the Internet by using Amazon or eBay. Larger items, such as old gas grills or heavy tools, can be listed on Craigslist, which allows you to avoid expensive shipping charges. If you have items that cannot be sold, consider donating. Although you won’t see real cash, you can write off these donations at tax time. There are several things to be aware of regarding credit cards once you transition into full-time self-employment. First, be certain that your rewards programs are conducive to your needs. If your new venture involves frequent air travel, find a card with great airline rewards. If you regularly travel locally, find a card with beneficial gas rewards. Make sure that you cash out any and all rewards on your existing accounts – the best way to do it is to request the reward in the form of a statement credit. You’re certainly going to need to get your hands on all available capital, especially in the beginning. When self-employed, you’ll be on your own regarding health insurance. While COBRA may be an option, it is advisable to first consult with a private health insurance professional. In some instances, you may be able to find a rate that is better than that of COBRA. I recently obtained private health insurance for a monthly premium that costs less than what my former employer offered. Of course, if you have a preexisting condition, your only affordable option may be to go on COBRA. Additionally, you should consider initiating a health savings account. If you choose a high deductible health plan, this is a great idea. Your money will grow tax-free as long as you use the funds for qualified medical expenses, and you can use these funds to satisfy your deductible. However, there are certain restrictions and eligibility requirements. For instance, you cannot be older than 65 or be claimed as a dependent on anyone’s tax return. There are also annual caps as to how much you can contribute per year. Despite the fact that your income may temporarily decrease, you’ll want to keep your retirement planon track. A previous employer-based 401k plan should be rolled over into an IRA. You should also consider implementing an individual 401k plan or an SEP IRA if you’re able to contribute more than the maximum to an IRA. Furthermore, if you previously had a 529 college investment plan in which the contributions were deducted from your paycheck, switch this to your checking account, so the program will not be neglected. I recently met a small business owner who had been up and running since the beginning of last year. When I asked her about paying quarterly self-employment taxes, she said she hadn’t yet looked into the subject. Don’t make this mistake – the IRS will be coming for you soon enough if you don’t pay your taxes on time. There are deadlines each quarter, and missing these can cost you big time with penalties and interest. Notate the due dates on your calendar, keep accurate records, and make your payments promptly. The financial aspects of being self-employed can take a lot of your attention, but it’s important that you do not neglect your physical well-being. The exercise that you used to get while working your day job will no longer exist. Unfortunately, I put on about fifteen pounds before I realized this. Plan on and factor in a daily exercise regimen once you make the move. It’s much easier to manage your weight than to have to lose weight. Ultimately, quitting your day job has many benefits and is very satisfying. With some hard work, creativity, and sacrifice, almost anyone can achieve this goal. What ways can you think of to save money as a small business owner? I think that if you really want to restructure finances, firstly you must increase your saving, secondly review your credit cards and make payments on time, this last option is the key to obtain a good credit score at same time a impeccable financial life. Interesting tips. Personally I feel that if you want to go for a self made business, you should have ample amount of monetary resource in hand. 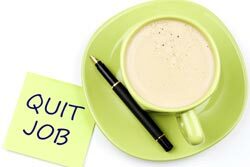 Likewise in case you are into a job and planning to quit it in order to establish your business, you shouldn’t do it before you financially establish yourself well enough to invest into anything. Good tips here. Depending on the state you live in, it’s often possible to find good heath insurance options when you’re self employed (though you might be faced with a deductible that’s quite high). The HSA has some great tax advantages, so make sure to take advantage of this if it all possible. I’m just considering going self employed full time and your comments are very useful. Like you I’ve been trying to increase my financial emergency fund, and I think this is a superb tip. I’m also trying to organise my home so that I have a dedicated office area. The tip on health insurance couldn’t be more appropriate and really should be top of mind for anyone considering starting their own business. COBRA is very expensive, but may be necessary for folks with preexisting conditions. Factoring that cost into your projections is a “must do” in my opinion. I would personally have a large emergency fund saved up first, just in case. You should definitely stay more on top of your expenses now that you are self-employed. I started to use your advice, savings is not far, but it seems all the more stacked. For some time it might be possible to optimize costs. When i switched employment, by biggest issue was with health insurance. I had a great plan through my employer and wasn’t happy when i had to find a private health plan. I eventually got one, but it was more expensive. I was on COBRA for a while, which is a good option if you lose your job or switch employers. Exciting guidelines. Individually I think that if you want to go for a self created business, you should have adequate quantity of financial source in side. All these tips are very helpful to save money for your retirement. But i am a young guy so i think i should also start saving money for my retirement.